From time to time, there may be an important update to Spectacles. These updates are made to improve performance, fix bugs, and improve your overall Spectacles experience! If you have a pair of Spectacles paired with your Snapchat account, then you’ll be notified when updates are available in Memories. You can also manually check for updates in Snapchat Settings. Tap ‘Check For Updates’ under the ‘UPDATES’ section. To begin downloading an update, your phone will need to be connected to Wi-Fi or cellular data, and have at least 75% charge — or be currently charging. 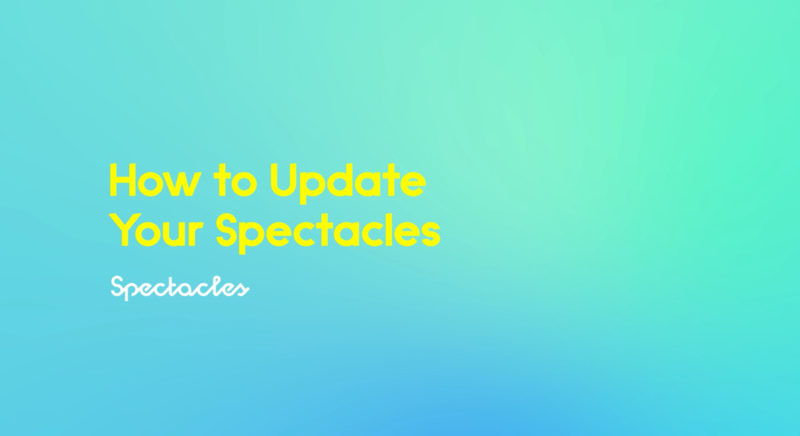 While updating, your Spectacles’ LEDs should light up in a triangle formation and rotate clockwise. Remember: don’t take Snaps with Spectacles while they’re updating! You may run into an error if you disconnect from your Wi-Fi connection, lose cellular data during the download, or get too far from your phone. Just try again when everything’s taken care of! Updates can take up a bit of storage on your phone — make sure you have enough space on your phone for the update! If you do not receive an ‘Update Complete’ message, wait a few seconds. There may be some instances where you’ll need to re-pair your Spectacles to your phone.